To kick off our new Friday night pizza eating tradition, we got pizza from 'zaw pizza to bake at home since, unfortunately, David wasn't here to eat dinner with us. 'zaw is a pizza place in the neighborhood that creates handcrafted, made to order pizzas using local, organic, and seasonal ingredients with the only caveat being, you bake the pizza yourself at home. It works well for us with our varying dinner times and the built in luxury of going out to pick it up at our convenience (i.e. after some playground time) without having to worry about it staying hot. Although, they do deliver AND they even deliver local wine or beer with your pizza, which I think is pretty great. Our pizzas were delicious. We had the Shroom Festival which has sautéed portabella, button, and crimini mushrooms from Ostrom’s in Olympia and fresh thyme, garlic, asiago, and mozzarella cheeses. We also had their seasonal pie which featured roasted chicken, caramelized onions, basil, feta, mozzarella, and chunks of rhubarb on a whole wheat crust with a homemade rhubarb balsamic sauce. It was as amazing as it sounds...and, if it doesn't sound that amazing, trust me...it truly is! It was a great start to pizza Fridays! My only complaint about 'zaw pizza is that their prices are pretty steep for a pizza you bake yourself. Their thoughtful ingredients and the unique pairings in their seasonal pies, plus its convenience to our house and Jack's school, are sure to have me going back though. And, next time, I will likely let them help me build the perfect night in by having them deliver a pizza, salad, and 6 pack of beer! A family note: We visited Jack's school this week to meet some new friends and teachers. Jack played really well and the teachers seemed to really like him! One of the teachers said to me as we were leaving, "I'm happy to have Jack in our class...he seems like such a cool kid. His attitude is great and he's so hip with his hair!". Be still my heart...! I've been smiling all day about it...I DO have a cool kid! And, these pictures are for everyone to smile at, but they are especially for my mom. 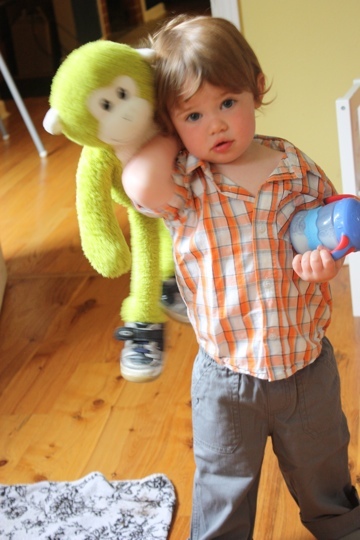 Mom, Jack loves his "ah ah" and insisted that the monkey wears his old shoes since he got new ones! I hope this makes you smile and feel better! Happy weekend everyone! Please stay tuned for a special post on Sunday...I'm doing my first blog give-away and it's a good one! All you have to do is read my post and comment to win!!! xxo.